The German Count Wolfgang "Taffy" von Trips won his first grand prix at the seaside circuit of Zandvoort, as Ferrari dominated with their V6 shark-nose cars. Phil Hill came second, with Richie Ginther only being denied third because of outstanding driving by Jim Clark and Stirling Moss in their Lotuses. On a beautiful sunny day the three Ferraris lined up on the front row of the grid, with Moss and Graham Hill just behind them. Von Trips got away fastest, closely followed by Phil Hill, and to many observers it seemed they would race through to the end with little opposition. However, Clark had other ideas and he worked his way through the field from 10th to eventually overtake Hill on the 22nd lap, establishing a new lap record for the 1.5 litre formula in the process. There followed a dramatic battle with the Ferrari and Lotus swapping places numerous times. Time and again Hill's faster Ferrari swept past Clark's Lotus on the long straight in front of the 70,000 capacity crowd, only to be beaten at the end of it by the superior cornering of the British car and Clark's exceptionally brave driving. This battle lasted for more than 40 laps until Hill's more powerful car won through and Clark had to be satisfied with a very worthy third place. Behind the three leaders, Moss and Ginther resumed their duel from the previous race at Monaco. Moss worked his way up into fourth, but by the halfway point, Ginther had overtaken him. Moss wouldn't give up and hassled the American right to the end where he managed to squeeze past on the last corner, grabbing fourth spot by less than a car's length. Up in front, von Trips drove serenely from start to finish, never relinquishing the lead. 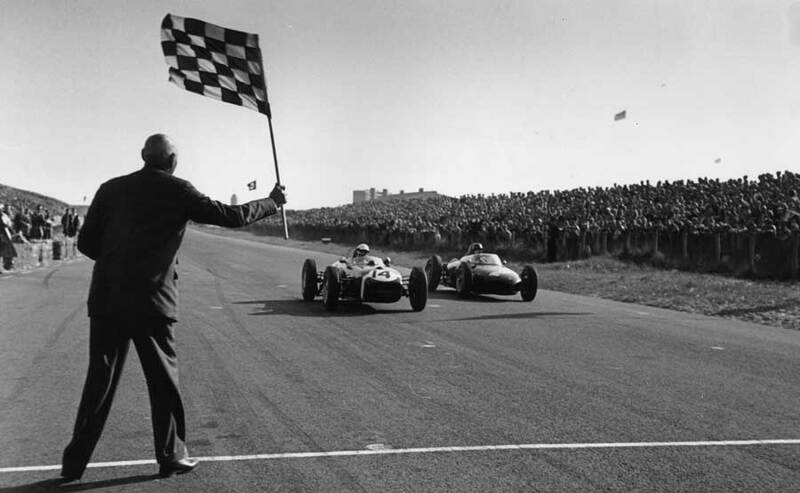 For the first time in a grand prix, there were no pit stops or retirements and all 15 cars finished. Moss and von Trips were now leading the world championship standings with 12 points each, with Phil Hill two points further behind.